After six years of absence, I will attempt my sixth marathon. I’m going to do it barefoot. It has been just under five years since Project Fuji. Time is relative. We get older. It goes faster and faster. In July 2011 I ran a half marathon up the side of Japan’s highest and most prestigious mountain, in memory of Christina, and to raise money for Oxfam. And, with all those who supported me, it proved a huge success. It was an incredibly rewarding experience and one of the greatest accomplishments of my life. But it came at a cost. After the Fuji Mountain Race, I was diagnosed with severe cartilage degradation in my left ankle. I knew something was wrong prior to going to the specialist, because I’d been training in pain for months prior to the race. I didn’t realise he was going to recommend I give up running. I’d already read Born to Run. I’d already bought a pair of Vibram Five Fingers (VFFs) as part of the growing barefoot craze. I’d entertained the idea of transitioning to barefoot, but wanted to wait until after Fuji. So that was it. It was time to give it a go. And so began a very long painful transition, with a few great races in amongst many more injuries. The myth that barefoot will decrease injuries, is exactly that, a myth. If you’re injury prone like me, it’s going to happen in shoes or without shoes… unfortunately. My body is just not built for running. But worse, my heart, my mind and my soul is. So, I have persevered, and persevered, and persevered. I’m not sure if this is comeback number three or 13. But here I am, giving it another go. I’ve trained throughout this year with one goal in mind: to see if I can run a marathon… barefoot (in VFFs). 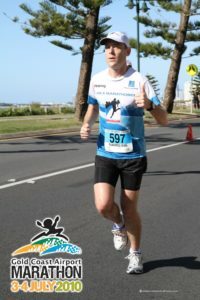 And if I am going to give the marathon another go, it had to be at one of my favourites: The Gold Coast Marathon. The training has not been easy. It has been riddled with illness and injury. I’m carrying a tendonitis injury just for something different: peroneal tendonitis. I may have to take yet another extended break after this. But on Sunday, at 7:20am, I will line up for marathon number six, in a pair of VFFs I have come to love almost as friends. I’m going to give it my best. I’m going to do this! Good luck, I hope you come through it relatively unscathed. Sounds exciting; especially after a long break from running! I’ve been running in minimal running shoes – less cushioning and generally lighter in the past year. Good luck with your first marathon in VFFs. Hope to read about it next week!